Kilee Brookbank was a typical sixteen-year-old, but her last ordinary day erupted in an explosion that consumed her house, burning forty-five percent of her body and sending her to the brink of death. After thirty-eight days of surgeries, skin grafts, physical therapy, and excruciating pain, Kilee had to discover how to live again. 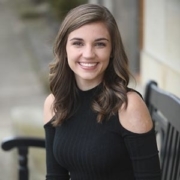 Now a thriving college student, Kilee has become an author, advocate, and philanthropist focused on helping other young burn survivors and their families. She has met with individual survivors and their parents and spoken to school groups, burn camps and civic organizations across the country. Her charity, the Kilee Gives Back Foundation, has raised more than $100,000 for Shriners Hospitals for Children-Cincinnati, and Kilee has partnered with Shriners Hospitals to promote its national Be Burn Aware campaign. … It’s what you do with each moment that defines you. A portion of the proceeds from sales of Beautiful Scars: A Life Redefined will benefit Shriners Hospitals for Children-Cincinnati. 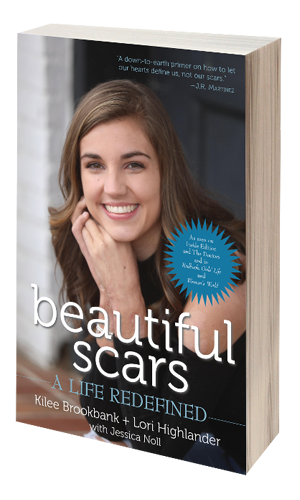 Kilee Brookbank discusses why she shares her story in Beautiful Scars. Kilee Brookbank is a college student, soccer player, shoe fanatic, animal lover – and burn survivor. Severely injured when a gas leak caused her house to explode in November 2014, Kilee was hospitalized for thirty-eight days before returning home to a life of new challenges and a new “normal.” Kilee, who attends Xavier University, is preparing for her future with strength and determination that inspire everyone she meets. She and her family created the Kilee Gives Back Foundation in 2015 to support other families through times of crisis, and Kilee is devoted to paying forward the generosity and kindness she received from her community and from around the world. Lori Highlander is, first and foremost, proud mom to daughter Kilee and son Cameron. 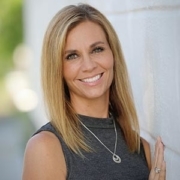 Lori has spent 20 years as an executive in the alcohol and drug addiction field and has witnessed first-hand the impact of information and inspiration on the healing process. In 2014, Lori’s daughter, Kilee Brookbank, was severely burned in a house explosion. Kilee’s resilience and Cameron’s strength compelled Lori to launch KiCam Projects, creating an avenue to bring light to powerful stories of survival with the goal of supporting charitable endeavors and organizations. Additionally, Lori and her family formed the Kilee Gives Back Foundation, a nonprofit inspired by the family’s personal experience. Lori lives in Georgetown, Ohio, with Kilee and Cameron; her husband, Wade; and her stepsons, Collin and Houstin. Beautiful Scars: A Life Redefined is distributed by Baker & Taylor Publisher Services.